America’s Thanksgiving Day Parade, 60 miles from Lansing in downtown Detroit on Thanksgiving morning, is free and easy to get to and out of. The parade, founded in 1924, stretches over a mile starting at the intersection of Woodward Ave. and Kirby St. at 8:45 a.m. and concludes at noon near Jefferson Ave., so traffic from Lansing and parking is manageable because spectators arrive and leave at different times. Some simply walk to Ford Field after the parade to see the Detroit Lions football game. Emmy Award-winning CBS Sportscaster Jim Nantz will appear as parade Grand Marshall and then call the game. I’ve accompanied Nantz’s wife Courtney and their children to the parade on previous visits while he prepares for kickoff, which he will do this year after his family joins him actually in the parade. Cornwell’s Turkeyville U.S.A., in Marshall, less than an hour’s drive from the capital just off I-69, is the kind of low-key, low-cost family fun that is charming and kitschy. 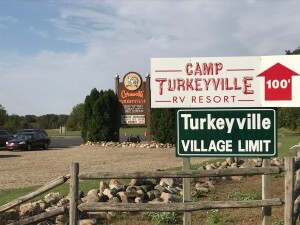 Turkeyville, a farm serving Thanksgiving dinner and lunch all year in its’ all-turkey restaurant, also has a bakery; lunch and dinner shows; an ice cream parlour; an extensive old country specialty shop; arcade games; and a calendar of special events including comedy nights. Best of all is the chance spend as little or as much time as you like wandering amongst colorful turkeys on the grounds and see farm animals in the barn. There is no admission fee. It’ll be home cooking for the Spartan football team since they play Rutgers at home on Saturday. Wandering the expansive pre-game tailgates on campus can be a trip in itself. But if you’re traveling to Columbus to see the Wolverines on the gridiron against their rival Buckeyes, beware that historically the Ohio State troopers seem to love writing speeding tickets to motorists with Michigan license plates. Spirited scarlet and gray Ohio State fans on campus can be verbally vicious to valiant visiting spectators in maize and blue, too. “I will not go back to Columbus. I have had nothing but really, really bad experiences there,” University of Michigan Regent Andrea Fischer Newman told me. She never minds traveling via Delta Airlines anytime since she spent years as an executive with the company and is thankful for Delta’s effort to make holiday travel efficient and pleasant via Lansing, Detroit, Grand Rapids or any of Michigan’s regional airports. Near or far let the holiday travel season begin!